Jesus Christ got married to Mary Magdalene, an ancient script appears to claim. 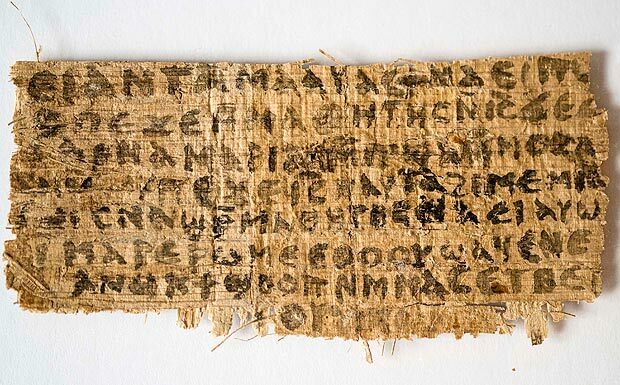 A previously unknown 1,700-year-old papyrus fragment makes reference to the son of God having a wife. Harvard boffin Karen King, who unearthed the document, said the fourth-century text is the only to suggest a marriage existed. The rare find echoes a theory from Dan Brown’s bestseller The Da Vinci Code. The woman mentioned, called Mary, is thought to be Mary Magdalene. The find will reignite fierce debate in the Christian world over whether Jesus ever got married. The belief he was abstinent is behind the tradition of celibate priesthood in the Catholic Church. It will also cast double over Mary’s biblical role as a sinner. King revealed the find at a conference in Rome. The full 1.5in by 3in text reads: “The disciples said to Jesus, deny. Mary is worthy of it Jesus said to them, My wife she will be able to be my disciple. King believes the text is a copy of a gospel probably written in Greek in the second century. She said: “Christian tradition has long held that Jesus was not married, even though no reliable historical evidence exists to support that claim. “This new gospel doesn’t prove that Jesus was married, but it tells us that the whole question only came up as part of vociferous debates about sexuality and marriage. However, some experts urged caution. Bible scholar Ben Witherington said texts from this period often used “the language of intimacy” while talking about spiritual relationships.